Armenian Night - series of film events bringing you Central and Eastern Europe best cultural masterpieces to Birmingham. The Colour Of Pomegranates" with the post-screening discussion, Armenian food and some wine. The film paints an astonishing portrait of the 18th-century Armenian poet Sayat Nova, the ‘King of Song’ . 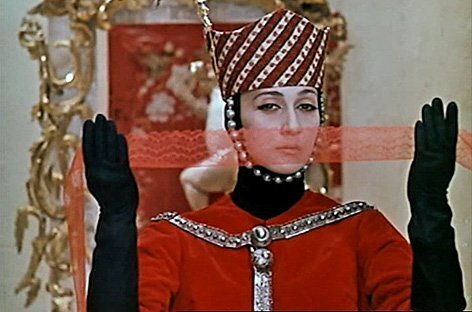 This is stylized, surreal biography of Armenian Sayat-Nova , whose life is depicted through amalgamations of poetic images, a discovery of the female form, falling in love, entering a monastery and dying, all framed through both Sergei Parajanov's imagination and Sayat Nova's poems. The film is presented with little dialogue using active tableaux which depict the poet's life in chapters: Childhood, Youth, Prince's Court (where he fith a tsarina), The Monastery, The Dream, Old Age, The Angel of Death and Death. There are sounds and music and occasional singing but the dialogue is rare. Each chapter is indicated by a title card and framed through both Sergei Parajanov's imagination and Sayat Nova's poems. According to Frank Williams, Paradjanov's film celebrates the survival of Armenian culture in the teeth of oppression and persecution: "There are specific images that are highly charged — blood-red juice spilling from a cut pomegranate into a cloth and forming a stain in the shape of the boundaries of the ancient Kingdom of Armenia; dyers lifting hanks of wool out of vats in the colours of the national flag, and so on". Sergei Parajanov (Armenian January 9, 1924 – July 20, 1990) was an Armenian film director and artist, who was born and raised in Tbilisi/Georgia, Soviet Union. Paradjanov made significant contributions to Soviet cinematography through Ukrainian, Georgian, and Armenian cinema. He invented his own cinematic style, which was totally out of step with the guiding principles of socialist realism (the only sanctioned art style in the USSR). This, combined with his controversial lifestyle and behaviour, led Soviet authorities to repeatedly persecute and imprison him, and suppress his films. Although he started professional film-making in 1954, Parajanov later disowned all the films he made before 1965 as "garbage". After directing Shadows of Forgotten Ancestors (renamed Wild Horses of Fire for most foreign distributions) Parajanov became something of an international celebrity and simultaneously a target of attacks from the system. He paid a heavy price for his outspoken criticism of Soviet cinema and the authorities: Soviet movie studios rejected all his projects after The Color of Pomegranates, and he was arrested in 1973 and sentenced to 5 years in a Ukrainian prison in 1974. He was imprisoned until 1977, despite pleas for pardon from various artists. Even after his release (he was arrested for the third and last time in 1982) he was a persona non grata in Soviet cinema. It was not until the mid-1980s, when the political climate started to relax, that he could resume directing. Still, it required the help of influential Georgian actor Dodo Abashidze and other friends to have his last feature films greenlighted. His health seriously weakened by four years in labor camps and nine months in prison in Tbilisi, Parajanov died of lung cancer in 1990, at a time when, after almost 20 years of suppression, his films were being featured at foreign film festivals. Sergei Parajanov is buried at Komitas Pantheon in Yerevan. Parajanov's films won prizes at Mar del Plata Film Festival, Istanbul International Film Festival, Nika Awards, Rotterdam International Film Festival, Sitges - Catalan International Film Festival, São Paulo International Film Festival and others.